How much is Kirsten Gillibrand Worth? Kirsten Gillibrand net worth: Kirsten Gillibrand is an American attorney and politician who has a net worth of $600 thousand. Kirsten Gillibrand was born in Albany, New York in December 1966. She is a Democrat who graduated from Dartmouth College and earned her JD from the University of California, Los Angeles. Gillibrand served as a member of the U.S House of Representatives from New York's 20th district from January 2007 to January 2009. She became a United States Senator from New York in January 2009. Kirsten Gillibrand held positions in government and private practice and worked on Hillary Clinton's U.S. Senate campaign. In 2019 she official entered the race for the 2020 Presidential election. She has criticized President Bill Clinton and Senator Al Franken for sexual misconduct. 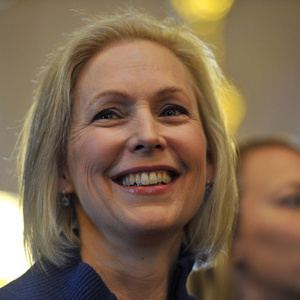 Kirsten Gillibrand supports paid family leave, the abolition and replacement of the U.S. immigration and Customers Enforcement, and a federal jobs guarantee. She has been a member of the Committee on Agriculture, Nutrition and Forestry, the Committee on Armed Services, the Committee on Environment and Public Works, and the Special Committee on Aging.